His Holiness pointed out that Buddhism was established in Tibet during the 8th century and that the works of eminent masters of Nalanda University became the monks’ textbooks. He recalled that Buddhism had been introduced to Mongolia in three phases beginning with its spread through Central Asia during the first millennium CE. The second phase, in the 13-14th centuries, involved Drogön Chögyal Phagpa, who was invited from Tibet. In the 16th century, the 3rd Dalai Lama Gyalwa Sönam Gyatso introduced the teachings of Tsongkhapa, which spread throughout the country. In due course, Mongolia and the Mongolian states of Buryat, Kalmykia and Tuva gave rise to many eminent Buddhist scholars. “When I first visited Mongolia in 1979, although Mongolia was still under communist rule, I was impressed to see how faith in the Dharma had survived. Faith, which is a part of all religious traditions, is passed down from generation to generation. However, in the Nalanda Tradition faith is augmented by reason and philosophy. At the present time it’s important that we become 21st century Buddhists with a sound understanding of what the Buddha taught. His Holiness expressed delight that several hundred Mongolians are now studying at the monastic universities in south India. He looked forward to their being able to contribute to the revival of Buddhism in Mongolia, Buryatia, Kalmykia and Tuva. In answering questions from the audience His Holiness emphasized the need to train the mind. Noting that whether or not you choose to observe a religious practice, everyone needs to be guided by a sense of ethics, therefore he encourages people to take an interest in secular ethics. 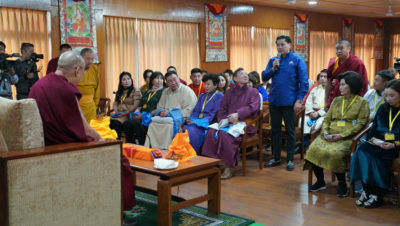 He suggested that observing secular ethics is equivalent to the basic sense of warm-heartedness cultivated by Tibetan and Mongolian Buddhists.